Cute and playful - how great. This I want to have. Robo-Q are tiny bipedal, humanoid machines, that are about the height of a matchbox. 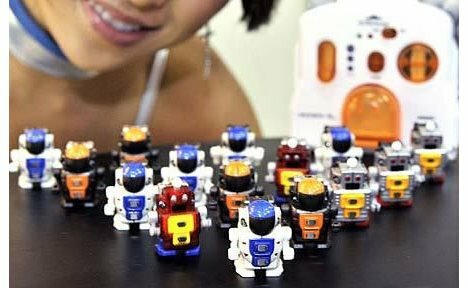 They are remote controlled and things will get interesting if you think of games you are able to play with them. Two ideas are on the picture below: maze and soccer. 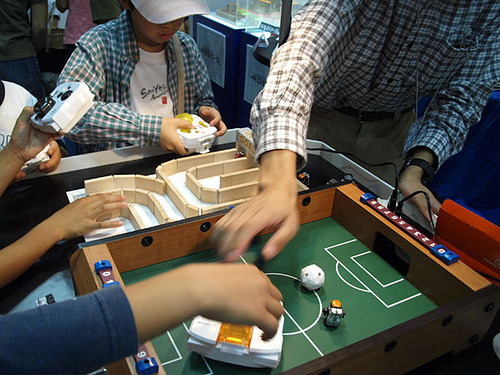 The idea to playing soccer one against the other with a paper-football and two robots I like best. You can also start to automate this mini-machines. Pressing its Auto button puts it into Artificial Intelligence Mode when it gets information from the two "Obstacle Recognition Units" on its sides and determines the proper way of action from the built-in database and decides whether it should evade or pursue its target. They should cost about 36 Dollars each, so not too much for having one. Making a bigger soccer-match with 22 players indeed would be a little bit more expensive.